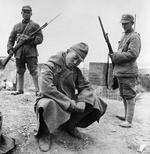 ww2dbaseOn 2 Nov 1943, Japanese troops occupied the undefended city of Changde in northern Hunan Province. On 18 Nov, the Chinese 57th Division successfully attacked and regained the city. The Japanese 11th Army under the command of Isamu Yokoyama retaliated immediately, attacking with a strong force persistently but failed to re-take the city. Both sides engaged about 100,000 men in this battle, and both sides suffered a high casualty rate of about 40-50%. ww2dbaseAmidst the stalemate during the battle, the Japanese deployed biological and chemical weapons. Artillery pieces launched shells containing either mustard gas or lewisite into the city, inflicting serious casualties on both Chinese military personnel and civilians. Additionally, the Japanese units present were also accused of spreading bubonic plague in and near Changde. 2 Nov 1943 Japanese troops occupied the undefended Chinese city of Changde. 18 Nov 1943 Chinese 57th Division attacked and recaptured the city of Changde.